As Packer fans, we're still heartbroken by the loss to the Cardinals back on January 16. After yet another beautiful Aaron Rodgers Hail Mary touchdown, it was tough to watch that broken play in overtime that led to the game-losing touchdown by Larry Fitzgerald. It's always hard for the season to end in a loss; however, Aaron Rodgers spoke during his post-game press conference in a manner that, once again showed us that he is one classy dude. After the crushing defeat, instead of focusing on how hard it was to take the loss, he said, "I'm just really proud of these guys." He continued to talk about how the team battled, how the guys are warriors. The best quote of the press conference to me was easily, "I love being a Packer." He also said, "We're fortunate enough to play this great game and to be a part of such a special organization like we are." As Packer fans, we've been lucky to be able to cheer for one of the best, most iconic sports organizations in the world. Rodgers continued to explain why losing to end the season is so tough, "One moment you're hanging out with your teammates on a road trip and the next moment everybody goes their separate ways. The relationships are so special." He continued to talk about how, throughout a crazy season, the the team stuck together and continued to believe in each other. I thought his most profound statement was this: "There's so much hope and belief." Rodgers has made us all believe and given us all hope – on the football field and off. On the field, it feels like the Packers have a chance to win every single game. Off the field Rodgers is a part of the MACC Fund where he brings a lot of joy and hope to some truly unique people, meeting and sharing stories with some great people, bringing awareness to pediatric cancer and other important causes. "We're just shining the spotlight on some people that are doing some amazing things. We're just using our spotlight, and it's pretty awesome." says Rodgers. You can see some super inspiring videos where Aaron helps bring awareness to these causes at itsaaron.com, further showing his remarkable, genuine character. Warning: Those videos may bring a grown man to tears. So I hear. We've all "gotten to know" Aaron through his interviews, radio show, seeing him play on the field, and don't forget about the TV commercials where he shows off his personality on a regular basis. The more we see of him, the more you can tell how caring, humble, and cool he is under fire. This season he showed us a different side. He showed patience and his ability to face adversity – and still help the Packers find a chance to contend for a title. As Packer fans over the last 20 years, we've never experienced a roller coaster season quite like this past one. After starting 6-0 with wins over the really solid Seahawks and Chiefs teams, we all had the Packers at the top of our power rankings and penciled them in to play in Super Bowl 50. Then they lost the next two games to the Broncos and Panthers, both really good teams that will be meeting in the Super Bowl in two weeks. Then the Pack lost to the Lions at home, something that hasn't happened since 1991. Everyone wrote the Packers off and said their season was over. When the media was focused on a loss, Rodgers made it a point to use his voice to show that he is one of the most humane players in the league. When it comes to his success on the field, it's obvious that there is a sizable chip on Aaron's shoulder. In a 2012 ESPN E:60 piece (watch it below), Rodgers says he feels like he has always been overlooked, under-appreciated, and felt like he deserved an opportunity. Throughout high school he wasn't recruited by any major colleges. His mom said he kept his college rejection letters as motivation when several teams didn't feel he was good enough to play for their University. He ended up playing at Butte Community College near his hometown of Chico, CA to which he still shouts out on Sunday Night Football introductions. Although he left Butte for a bigger, more visible school, in an interview after his last game at Butte, Rodgers said, "Butte has been everything I've hoped and even more," acknowledging his appreciation for the opportunity to continue to show the world that he could play. He said he flew under the radar and that was the best thing that happened to him. The chip on his shoulder grew as he always felt the need to prove himself. 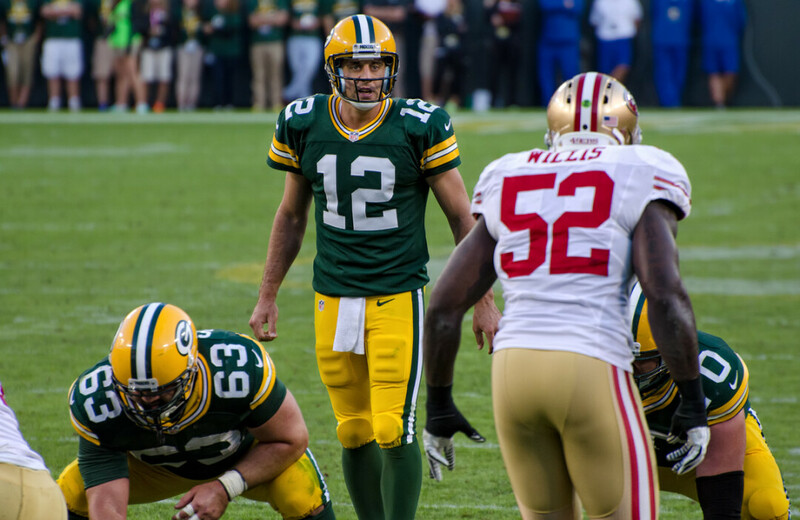 Although he has been doubted throughout his career, Rodgers has never lacked confidence. He says confidence is the most important trait of a quarterback, especially to be able to instill that confidence in his teammates. Rodgers has certainly instilled confidence in Packer fans. After proving his skills at Cal, Rodgers was projected by some scouts to be the first pick in the 2005 NFL Draft. It just so happened that the team he loved growing up, the San Francisco 49ers had the first overall pick. They instead selected Alex Smith and Rodgers kept dropping and fell to the Packers at the 24th pick, making the chip on his shoulder even bigger. Rodgers admitted it was embarrassing, but he would handle that small setback with class, saying that he couldn't wait to get in to meet his Packer teammates and to learn the system. Of course, he would have to sit behind the living legend Brett Favre and the awkwardness that Favre would put Rodgers and the Packers' organization through. Despite the media attention, the questions about wanting to play, the retiring and un-retiring, fans wanting Favre over him and all the crazy things that would make any of us bitter, Rodgers remained humble and classy, never saying a bad word about Favre, the fans, or the Packers' organization. He just kept working. A few years ago at the NFL Combine, I ran into legendary Sports Illustrated writer Peter King and we spoke about Rodgers. When King found out I'm from Wisconsin and a Packer fan, he just shook his head and said, "Man, how your QB handled that Favre situation was just stupidly polite!" He continued to rant about how we've never seen a guy like this before, who played at such a high level and carried himself in the respectable manner in which Rodgers carries himself. High praise for Rodgers once again. "I don't really desire anymore to be the best quarterback in the NFL. I want to be remembered as one of the best men that ever played quarterback in the NFL." Those closest to him have great stories about his class as well. In that same ESPN piece, Aaron's' mom Darla talked about what Aaron told her. "He said my goals have changed, mom. I don't really desire anymore to be the best quarterback in the NFL. I want to be remembered as one of the best men that ever played quarterback in the NFL." That may be one of the most profound things I've heard from any athlete anywhere. 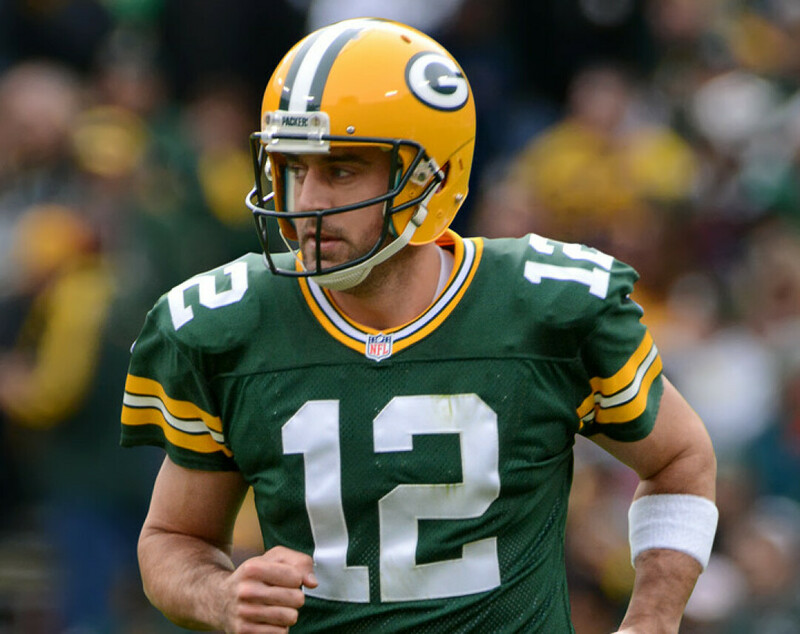 Aaron has led the Packers to 7 straight Playoff appearances. He's a 2-time NFL MVP, a Super Bowl Champion and Super Bowl MVP. He's killing it on the field. He's also super entertaining off the field. Back in June Rodgers' girlfriend Olivia Munn posted a video of her with a sword, with Aaron in the background swinging what appears to be a bamboo stick. Then in December, she posted a photo of herself in a Star Wars t-shirt, with Aaron wearing a full-on Obi-Wan Kenobi robe. Rodgers isn't afraid to have fun in life and has demonstrated a pretty great sense of humor, as heard on his radio show and in the media throughout the years. One of my favorite things about him is that he's a big Vlade Divac fan. Aaron's also not afraid to show off his brains. As if his film study and defense dissection isn't enough, he got a 1310 on his SATs back in the day, and he recently won Celebrity Jeopardy, seemingly a dream come true. We've heard stories about how important it is to him to really get to know the names of his teammates and their wives and kids. That team building and team chemistry really shows through on game days. He has his teammate's backs and as fans, it feels like he has ours as well. The traits that he says scouts overlook are character, mental toughness, and physical toughness. I'd add heart and drive to that list for Rodgers. The Packers are the lifeblood of Wisconsin and Rodgers is the lifeblood of the Packers. We've never witnessed a person like him before. I'm comfortable saying that Aaron Rodgers is the most loved and respected athlete we've ever seen. Stay classy Aaron. See you next season.